Lisle, IL – Anita Callahan, a program coordinator at the Larry J. Bell Community Learning Center, a Lisle-based program that is operated by Ray Graham Association for People with Disabilities, recalls the day she met Kevin Krause from Support Our Troops, another Lisle non-profit dedicated to boosting morale and spirit of soldiers and their families worldwide. Both organizations have adjacent office space in the business park near University Lane and Yackley. Callahan was always seeking local volunteer opportunities and projects for the people with disabilities that she supports. “We want to give back and be actively engaged in the community so the partnership that we eventually formed with Support Our Troops has been a match made in heaven,” said Callahan. For the past six years, people with disabilities have looked forward to volunteering for Support Our Troops. 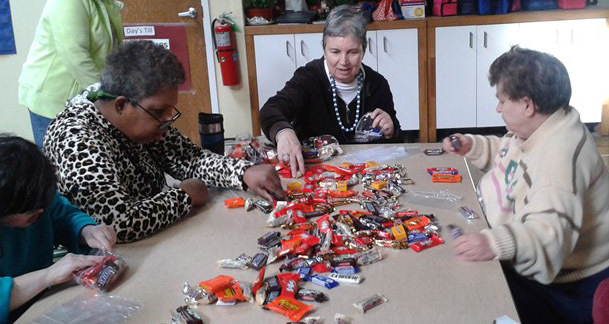 They spend time each week signing cards for soldiers, sorting and packaging candy that will be sent to troops and their families, and so much more. “They love knowing that they are doing something good for someone else,” added Callahan. “We’re like a family,” said Krause. “We are grateful for each other and enjoy the times we get to visit together.” Recently, the people with Ray Graham Association got a wonderful surprise when three active Marines and several other volunteers from Support Our Troops stopped by the Community Learning Center to thank everyone for all of their hard work. According to Callahan, the gratitude was reciprocated and people thanked the Marines for their dedication to keeping everyone safe and serving our nation. Ray Graham Association believes that people with disabilities should be connected to the communities in which they live, work and play. As such, people supported through the organization find great joy in volunteering over 2,500 hours each year with 14 DuPage County organizations including Support Our Troops, Meals on Wheels, and PADS. Ray Graham Association serves nearly 2,000 children and adults with disabilities in DuPage County and the surrounding areas through residential, employment, life skills, recreational, and family support services.